The Andes are attracting global interest again: they hold valuable mineral resources, tourists appreciate their great natural beauty and the diversity of indigenous cultures, climbers scale rock and ice faces, while many others are intrigued by regional political developments, such as the Bolivarian revolution in Venezuela or the almost unfettered hegemony of the neoliberal economic model in Chile. This volume is the first attempt for decades to present a complete overview of the longest mountain chain on the planet - a region of remarkable climatic, floristic and geologic diversity, where advanced civilization developed well before the arrival of the Spanish. 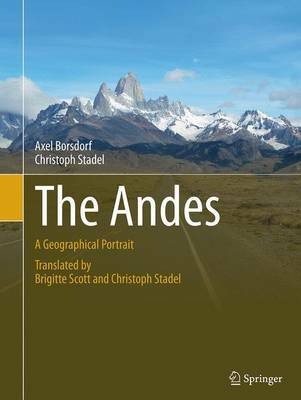 Today the Andes continue to be characterized by their ethnic, demographic, cultural and economic diversity, as well as by the disparity of local socioeconomic groups. The Andean countries pursue a wide range of approaches to tackle the challenges of making the best use of their natural and cultural potential without damaging their ecological basis, as well as to overcome economic disparity and foster social cohesion. This book provides insights into this unique region and its most pressing issues, complemented by a wealth of pictures and comprehensive diagrams, which, in sum, help to better understand these fascinating mountains.